An upgraded arrangement on our most popular wind and sun wall art design. This new popular Spiral Windswept sun is taking flight, literally! An exquisite combination of glass and galvanized metal, we've incorporated a more natural feel, larger size, and mixed elements design. 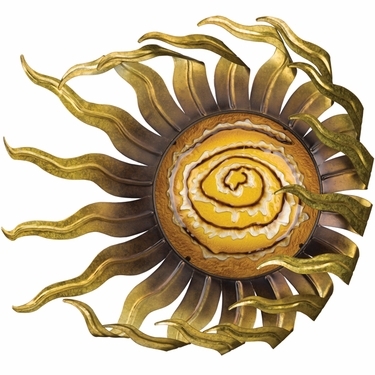 Quickly becoming more popular than our original Wind and Sun Decor this new sun is quite a work of art. If you're looking for a very special gift or housewarming present, this beautiful sun works very well outdoors as well as indoors, as a centerpiece on a living room, den or indoor porch wall. Even more impressive than this picture can show, you will love how this sun decor instantly brings beauty and warmth into your life.